Adventures in CSA (week 2): Beets, huh? 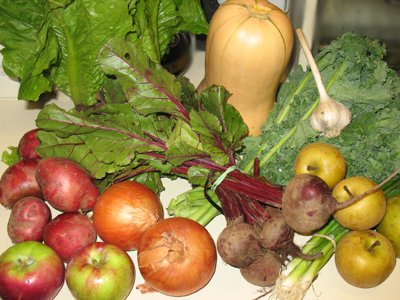 Onions and apples and beets, oh my! I haven’t yet figured out everything we’re going to do this week; plus, not everything needs to be used this week (or is fully ripe enough to use just yet). The squash is more likely to get cooked next week, after it’s had a chance to finish ripening. The potatoes are likely to be turned into rosemary-garlic fries again, and the kale is destined to be our first batch of kale chips (thanks to Daily Cynema for the recipe and to My Kinda Rain for inspiring her!). Don’t be surprised if the beets end up in the crock pot. Pretty much everything gets a go in the crock pot in this house, eventually. Price comparison for the week 2 box will go up sometime on Monday, after I’ve had the chance to go to the store. Sunday, our usual grocery shopping day, DH and I will be walking a marathon (YES YOU READ THAT CORRECTLY) to raise $$ for the Jimmy Fund. So, cooking’s not super high on the priority list this weekend. That’s okay – it just gives me fodder for talking about what it takes to train to walk a marathon, assuming I’m able to make my way across the finish line Sunday under my own power. Wish me luck! Yeah, I’m not sure what I would do with beets either. But I know my husband likes them, so I’m sure he would eat them. I have a recipe for butternut squash and apple soup I used a while back I can pass on. I thought it was really good, but the rest of the family thought it was so-so. Good luck on the marathon this weekend!